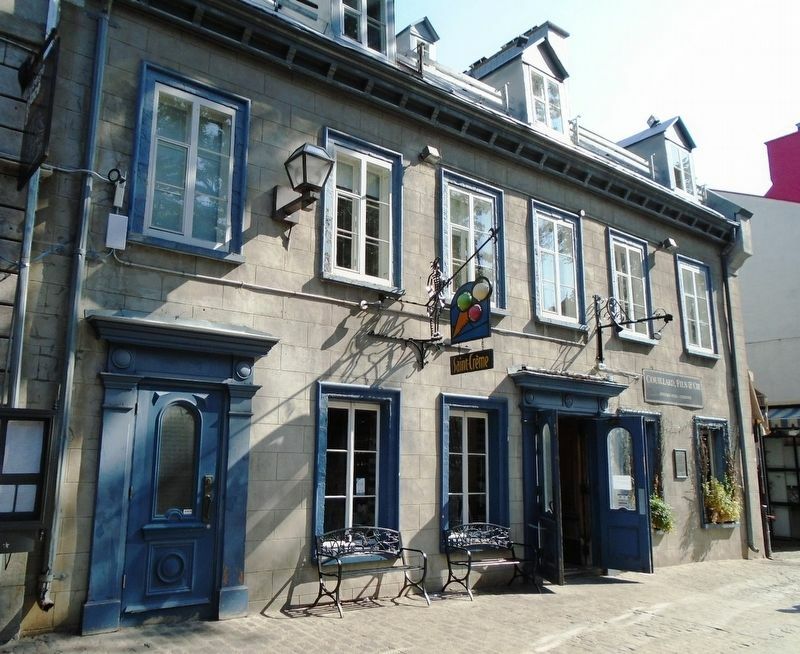 It was in this house, built in 1732 for the merchant Charles Berthelot, that Pierre-Joseph-Olivier Chauveau, leader of the Conservative Party and Premier of the Province of Quebec from 1867 to 1873, lived until his death. Lawyer, humanist and man of letters, P.-J.-O. Chauveau became a member of Parliament for Quebec in 1843. The first head of the Quebec state after Confederation, he obtained a difficult consensus regarding the organization of the state apparatus, the sharing of Canada's debt, and the school question which opposed Catholics and Protestants. P.-J.-O. Chauveau devoted a great deal of enthusiasm to setting up the education system in Quebec, notably creating normal schools. C'est dans cette maison, construite en 1732 pour le marchand Charles Berthelot, que grandit et vécut jusqu'à sa mort Pierre-Joseph-Olivier Chauveau, chef du Parti conservateur et premier ministre de la province de Québec, de 1867 à 1873. Avocat, humaniste et homme de lettres, P.-J.-O. Chauveau s'engagea en politique comme député de Québec, en 1843. Premier chef de l'État québécois au lendemain de la Confédération, il obtint de difficiles consensus concernant l'organisation de l'appareil étatique, le partage de la dette du Canada Uni, et la question scolaire qui opposait catholiques et protestants, P.-J.-O. Chauveau consacra une grande ardeur à mettre sur pied le système d'éducation du Québec, créant notamment les écoles normales. et conserva ce poste jusqu'à son décès, en 1890; il était âgé de 69 ans. At the same time, the politician led a literary career from which several poems and essays emerged: his novel, Charles Guérin, focused on the evocation of the Quebec mores of the 1830s. 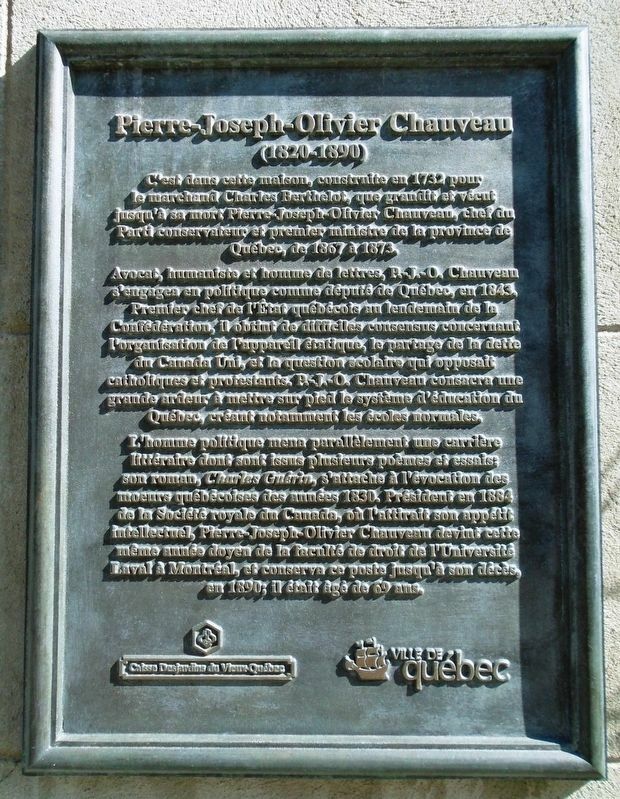 President of the Royal Society of Canada in 1884, which attracted his intellectual appetite, Pierre-Joseph-Olivier Chauveau became that same year Dean of the Faculty of Law of Laval University in Montreal, and kept this post until his death, in 1890; he was 69 years old. Erected by Ville de Québec et Caisse Desjardins du Vieux-Québec. Location. 46° 48.785′ N, 71° 12.375′ W. Marker is in Québec, Quebec, in Capitale-Nationale (region). Marker is on rue Sainte-Anne 0.1 kilometers west of rue du Fort, on the right when traveling west. Touch for map. Rue Sainte-Anne is pedestrian only in this area. Marker is at or near this postal address: 22 rue Sainte-Anne, Québec, Quebec G1R 3X2, Canada. Touch for directions. Other nearby markers. At least 8 other markers are within walking distance of this marker. Home of the Quebec Chronicle-Telegraph (within shouting distance of this marker); hic lacet franciscus de Laval / Here lies François de Laval (within shouting distance of this marker); Chapelle funéraire de Champlain / Champlain's Funeral Chapel (within shouting distance of this marker); Seneschal’s Court (about 120 meters away, measured in a direct line); Québec Court House (about 120 meters away); The VII Royal Fusiliers (about 120 meters away); Collège des Jésuites / Jesuit College (about 120 meters away); La pierre de la Croix de Malte / The Maltese Cross Stone (about 120 meters away). Touch for a list and map of all markers in Québec. More. Search the internet for Pierre-Joseph-Olivier Chauveau. Credits. This page was last revised on September 10, 2018. This page originally submitted on September 8, 2018, by William Fischer, Jr. of Scranton, Pennsylvania. This page has been viewed 44 times since then and 5 times this year. Photos: 1, 2. submitted on September 9, 2018, by William Fischer, Jr. of Scranton, Pennsylvania.